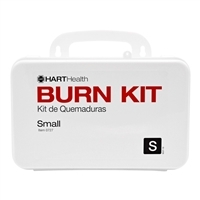 You never know when you, a member of your household, or someone at your workplace may be injured, but first aid products can ensure that burns, cuts and scrapes are taken care of properly. By purchasing first aid supplies online, you can save a lot of money, especially when compared to purchasing medical supplies individually. At SOS Survival Products, you'll find a variety of economical first aid supplies as well as bulk first aid supplies. 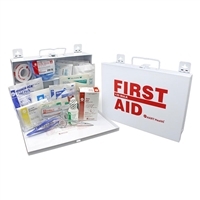 We carry everything from small, individual kits that can be carried in your pocket to industrial first aid supplies, perfect for offices with a large number of employees and factories. All of our kits come with the basics you'll need to deal with injuries, including bandages in different sizes, gauze pads, fabric strips and alcohol pads. 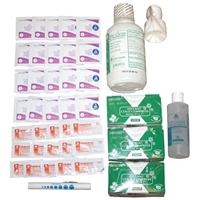 The more robust kits and cabinets ensure that you have everything you'll need and contain a complete set of tools and medical aids, such as cold packs, butterfly closures, antibiotic ointment, burn cream and painkillers. A disaster preparedness kit is an essential part of ensuring that you are able to deal with unexpected emergencies. With a trauma kit on hand, you can handle injuries and problems that occur at your home, workplace or in the outdoors. Even if medical attention is required, an emergency kit may help prevent injuries from becoming worse. At SOS Survival Products, we have a variety of trauma kits that contain the supplies you need to deal with physical injuries as well as inexpensive refills for these kits. Whether you need a disaster kit for a few people or a large number, we have well-organized and well-stocked kits to help you in critical situations. 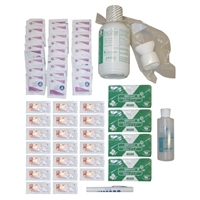 On our site, you'll find emergency disaster kit supplies include things like ice packs, butterfly closures, trauma dressings, bandages, emergency blankets and eye pads. 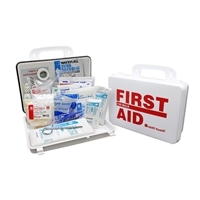 Our kits also include a first aid manual as well as a carrying case to ensure that your supplies are organized, portable and easy to access.